District play begins in Class 4A, Division I with four remaining unbeaten teams. Only two of those four teams are ranked heading into Week 7. District 1 seems to be the most competitive with No. 3 Basehor-Linwood (6-0), Atchison (6-0), KC Piper (4-2), and a beat-up Tonganoxie (4-2) squad. Atchison is trying to avoid a replication of 2015 in which the Redmen began the season 8-0, but missed the playoffs due to a Week 9 loss to KC Piper (38-21) and the resulting tie-breaking scenario. Other unbeatens include Andale, which lost All-State running back Zach Meyer to injury on the opening kickoff of the season, but has seen Tristen Dagenais step up and be nearly unstoppable in the run game. Abilene is also unbeaten entering district play for the third consecutive season. The Cowboys advanced to the state quarterfinals last fall before a 35-34 loss to Andover Central. But all the contenders are chasing top-ranked Bishop Miege (5-1). Since an season-opening 35-28 loss to 6A No. 2 Blue Valley, the Stags have blitzed their 6A & 5A EKL opponents by an average score of 46 to 12. Last week, Miege led defending 5A champion Mill Valley 64-7 in the third quarter before winning 64-21. Atchison (6-0) – Atchison is 6-0 and the champions of the KCAL title again this season. Quarterback Adam Smith leads the Redmen offense in completing 64 percent of his passes for 868 yards and 17 touchdowns to only one interception. Smith’s also rushed for 450 yards and nine touchdowns. Dylon Leblue leads Atchison with 661 rush yards and eight scores. Bryce Enzbrenner has 25 receptions for 494 yards and nine touchdowns. Atchison’s two biggest wins came 24-14 over Holton in Week 1, and 40-12 over Schlagle in Week 3. Basehor-Linwood (6-0) – The Bobcats have rolled to a 6-0 start and the No. 3 ranking in the classification. Basehor-Linwood has outscored opponents by an average score of 54 to 8. Justin Phillips has thrown for 894 yards and 12 touchdowns. His primary target has been Eric Scott who has 17 receptions for 279 yards and two touchdowns. Scott has also rushed for five touchdowns. Chas Rollo leads the Bobcat ground game with 625 yards and 11 scores. Tonganoxie (4-2) – After a strong start, the Chieftains have lost two of three. Tonganoxie has dropped a 21-12 decision to Bonner Springs and tough 28-24 to KC Turner. The Chieftains led Turner 24-0 last week before Turner rallied for the win. The game was suspended on Thursday and resumed on Friday when Jordan Brown, Zac Morgan, and QB Mason Beach didn’t play due to injury. Brown leads Tongy in rushing with 574 yards and six touchdowns, while Dalton Bock has 310 yards and four scores. Beach had thrown for 964 yards and 13 scores before being injured and missing the Turner game. Key Games: All game will be critical in what appears to be on paper the most competitive district in the class. Bishop Miege (5-1) – The two-time defending state champion Stags are on a five-game winning streak after suffering a 35-28 loss to Class 6A’s second-ranked Blue Valley in their season opener. Miege junior quarterback Carter Putz has passed for more than 1,500 yards. Senior Landry Weber has almost 700 yards receiving. Joe Watsky leads the defense with 57 tackles and three sacks. De Soto (5-1) – Coach Brian King hopes to take the Wildcats to the playoffs for a second consecutive season. De Soto’s only loss came 31-17 to Louisburg in Week 3. The Wildcats have posted shutout victories against Bonner Springs, Nevada (Mo.) and Baldwin. In their last three games, they have outscored their opponents 106-7. Spring Hill (4-2) – The Broncos are coming off a 28-27 upset of Louisburg. Spring Hill quarterback Jacob Letellier ran for two touchdowns and passed for another in the victory. The Broncos are on a four-game winning streak after dropping their first two games to Tonganoxie and Basehor-Linwood. In his second year at Spring Hill, Jason Feeback hopes to give the Broncos their first season with a .500 record or better since 2012. Eudora (2-4) – The Cardinals are on a three-game losing streak, falling to Louisburg, Paola and Ottawa. Phil Katzenmeier’s squad is down a year after finishing 8-4. Eudora is in danger of suffering its first losing season since 2008. Key Games: (Wk 7) Spring Hill at De Soto will likely decide the runner-up spot. Louisburg (5-1) – The Wildcats won their first five games before dropping a 28-27 heartbreaker last week at Spring Hill. The loss dropped Louisburg out of the top five of the Class 4A Division I rankings. Louisburg has bounced back as program, posting a 12-5 record over the past two seasons after finishing 3-6 in 2014. Ottawa (4-2) – The Cyclones’ four wins come against teams with a combined 7-17 record. Coach Rob Hedrick is attempting to bring Ottawa back to the playoffs after narrowly missing the postseason last year. Paola kept the Cyclones out with a 27-21 victory in Week 9. Fort Scott (3-3) – With Pittsburg no long in the Southeast Kansas League, it appeared time for the Tigers to become king of the mountain. However, Fort Scott is only 3-2 in the SEK, falling 43-42 to Labette County and 14-11 to Independence. The Tigers also were shut out 28-0 in a nonconference game at Pittsburg. Veteran coach Bob Campbell will try to avoid having the Tigers miss the playoffs for the first time since 2009. Paola (3-3) – Mike Dumpert’s Panthers enter districts on a two-game winning streak, posting victories over Eudora and Bonner Springs. Paola is a perennial playoff qualifier and finished 9-2 a year ago. The Panthers’ run last year ended with a 65-14 loss to Bishop Miege, the eventual state champion. Key Games: Every game is crucial in a district with four teams with records of at least .500. Independence (5-1) – Carl Boldra’s Bulldogs are enjoying back-to-back winning seasons after finishing with a 10-19 record from 2012-14. Independence and Labette County both enter districts with 2-0 records in the Southeast Kansas League. The Bulldogs’ only loss was 46-6 to an undefeated Basehor-Linwood squad. Labette County (4-2) – The Grizzlies must bounce back after a crushing 43-0 loss against the Frontenac Raiders. Before that loss, Labette County had scored more than 40 points during their previous three games. Sean Price, who is in his second year with the Grizzlies, has helped turn around a program that finished only 9-27 in the four seasons before he arrived. Coffeyville (3-3) – The Golden Tornado enter districts after consecutive losses to Galena and Fort Scott. Darrin Wegner is in his first season as Coffeyville’s head coach after the team finished 0-9 under Murray Zogg in 2015. Coffeyville is in danger of suffering its third losing season in a row after going 12-2 and advancing to the state championship game in 2013. Chanute (2-4) – The Blue Comets snapped a four-game losing streak with last week’s 42-14 win over Parsons. The 42 points Chanute scored against the Vikings is 13 more than the Comets scored in their first five games. Mulvane (4-2) – Mulvane, expected to be improved this season, has delivered an explosive offense following a 5-5 year last fall. The Wildcats have scored at least 35 points in every game behind standout dual-threat quarterback Jayden Price. Mulvane has lost to Andale and Maize South by a combined 12 points. However, the Wildcats own two signature victories with a 35-7 Week 4 road win versus Wichita Collegiate, and a 67-27 home victory against Conway Springs last week. Against Conway Springs, Mulvane delivered 613 total yards, including 181 rushing from Price and 142 by Keaton Shoemaker. Mulvane is third in scoring offense with 281 points. Ulysses (2-4) – Ulysses has struggled in the post-Ian Rudzik era, especially offensively. The Tigers have scored 103 points and permitted 180. Ulysses lost, 15-14, to Hugoton in Week 2 and 26-17 versus Goodland last week. From ’04-15, Ulysses had defeated Goodland 10 straight times. Wellington (0-6) – Wellington has lost eight straight contests, including six in a row this season with former Crusader standout Zane Aguilar in his first season as head coach. The Crusaders have scored just 44 points, second-fewest in the class, against the No. 8 SOS. They lost 7-6 at Rose Hill in Week 3 on a goal-line stand at the end of the game. Winfield (0-6) – Winfield is coached by Linn Hibbs, who has coached at multiple Kansas schools and enjoyed a long run of success at Wellington. Winfield has played the No. 6 SOS with just 42 points scored, fewest in the classification. Winfield is 1-10 in last 11 games. Key Games: (Wk 7) Mulvane at Ulysses will decide both playoff spots. Maize South (5-1) – Maize South has moved down after several successful years in Class 5A. The Mavericks lost, 21-14, at Buhler in Week 4, but then bounced back with a 38-35 road win versus Mulvane the following week. The Mavs, traditionally known for defense, rank seventh in scoring defense with just 84 points allowed. Linebacker Jordan Maxson is one of several key starters on a senior-heavy defense. Senior quarterback Ethan Richardson has been solid after taking over for Army signee and dual-threat signal caller Korie Frausto. Augusta (4-2) – The Orioles have been 5-5 and 7-3 under third-year coach Jason Filbeck. Augusta had an average margin of 27-15 last year with one of the classification’s stronger defenses. This fall, Augusta has outscored teams by an average margin of 27-16 and ranks in the top-10 in defense behind standout linebacker Dallin Marlnee (55 tackles, six TFLs). Junior Chance Whitehead has completed 48 of 97 passes for 1,058 yards with a 6/4 TD/INT ratio. Junior Clay Westbrooks has intercepted five passes for a team that has forced 11 turnovers and is plus-3 in turnover margin. Rose Hill (3-3) – Rose Hill, known more for soccer success in the fall, has quietly enjoyed a nice improvement following a winless season last year. The Rockets have not made the playoffs since 2013 or posted a winning record since its surprising 13-1 season and Class 4A state championship in 2011. Rose Hill owns wins against Wellington (7-6), Clearwater (16-14) and El Dorado (35-14). Andover Central (1-5) – The Jaguars were Class 4A-I state runners-up to Bishop Miege last season, but graduated its prolific skill players, including quarterback Payton Huslig. Andover Central picked up its first win last week with a 28-14 home victory against Towanda-Circle. It marked the most points scored and fewest points permitted this season. Key Games: (Wk 7) Maize South at Augusta should decide both playoff spots. Andale (6-0) – Andale has outscored teams 300-122 and ranks second in the classification in scoring offense. The Indians own several quality wins, including Labette County (49-8), Mulvane (61-52) and Wichita Collegiate (32-21). Last week, the Indians trailed Collegiate by nine points with five minutes left but came back to win. Tristan Dagenais has emerged as the workhorse, including 19 carries for 85 yards versus Collegiate, and Taylor Richter continues to run the offense well. Longtime coach Gary O’Hair has announced this will be his final season with the Andale. He and his wife are planning to move to New Mexico. Buhler (5-1) – The Crusaders took heavy graduation losses following the departure of quarterback Jace Williams and running back Dillon Engelland. Still, Buhler has outscored teams 178-120 and is the only team to defeat Maize South. Buhler is 1-9 against rival Andale in the last 10 meetings but did win 16-0 in the season opener last fall. 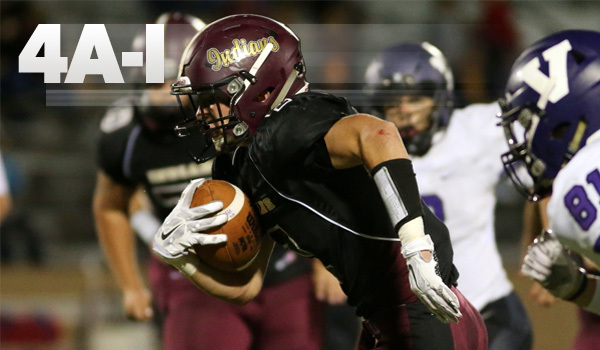 El Dorado (2-4) – El Dorado’s preseason goal was to win more games than last season’s 2-7 mark. The Wildcats have tied that so far with a 34-18 Week 2 home win against Wellington and a 62-6 road victory versus K.C. Harmon two weeks later. El Dorado has permitted at least 34 points in all four losses. Towanda-Circle (1-5) – Circle defeated Winfield, 28-14, in Week 2 and ended a 36-game losing streak. Circle has been more competitive in the last month with losses by four and 14 points in Weeks 4 and 6. Abilene (6-0) – Abilene is 14-1 in the regular season in the last two seasons. As well, the Cowboys are 14-0 in North Central Kansas League play since the start of the 2014 season, and 18-1 in conference since the start of ’13. One of just four unbeaten squads left in the classification, Abilene had outscored teams 201-76 against the classification’s easiest schedule, according to PPI. McPherson (4-2) – Michael Mendez, who has emerged on the defensive line, has led the Bullpups’ defense this season. The Bullpups rank No. 2 in scoring defense in the classification with just nine points permitted. Last year, the Bullpups went 5-4 and allowed 18.9 points a game. After two opening losses by a combined 21 points, McPherson has won four straight and permitted just 14 points. Wamego (3-3) – The Red Raiders won their opener, 18-6, at Rock Creek and then lost three in a row with just 17 total points scored. Wamego has righted itself some in the last two contests with two wins by a combined score of 76-22. Junior Justin Ebert has taken over under center from with the incumbent, Dillon Blain, who threw for 1,475 yards and 13 scores last season. Blain has moved to receiver in the last several weeks and has caught seven passes for 155 yards and five scores. Ebert is 23 of 36 for 414 yards with a 7/0 TD/INT ratio in the three contests. Hays (1-5) – Hays High has played by far the toughest schedule in the classification, according to PPI. HHS has lost to Valley Center, Great Bend and Garden City, all whom are undefeated, and won 31-21 at Scott City in Week 1. Hays High has dealt with injuries, most notably to two-way standout Shane Berens and lineman Freddy Haines.